I love the Pillsbury Bake-Off. Pure and simple. It has been a part of my family’s life for many years and has given us priceless memories. We are one of the few families of three-generation Bake-Off contestants. My mother, Pat Bradley, has been a contestant once, my oldest daughter, Kristina, has been twice, and I have been twice. In fact, my mother and daughter had the rare instance of competing grandmother against granddaughter at Bake-Off #35 in Orlando, where my mother was a category winner of $10,000, and my daughter won a runner-up prize of $2,000. Not bad for a 12-year-old at her first Bake-Off! 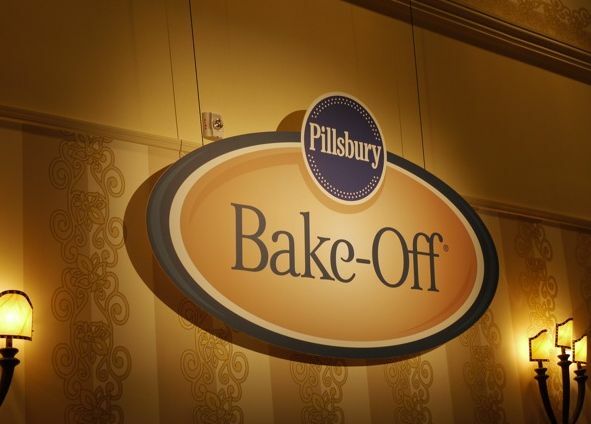 With our history, I was thrilled to find myself at a different spectrum of the 44th Bake-Off contest held this past week in Orlando. I attended as a blogger, rather than a contestant. Unless one has been a contestant, it is hard to explain the excitement and anticipation of a Bake-Off contest. Even though there was not a million dollars at stake or a chance to rub elbows with Oprah when I competed at the 32nd and 34th Bake-Off’s, I still observed the same mix of awe and confidence coupled with a bit of butterflies in the stomach, as the contestants made their way through the doors and started their ovens. I must admit, as I watched the contestants stride confidently to their respective ovens, I missed being one of them for a minute. However, it didn’t take long for me to feel unafraid and secure in my new adventure as a blogger writing about my favorite contest. I felt I had a different perspective than other media because I had been a former contestant, and understood being in their shoes. I was ready to walk down the aisles, take in the wonderful aromas, and be incredibly excited for the contestants, because I understood their nervous adrenalin. I wanted to say to them all, good luck, don’t be nervous, take it all in, and make new friends with your fellow competitors. While contestants were preparing for the cooking competition of a lifetime, the media, including food writers, cookbook authors, food industry executives, and my fellow bloggers were wined and dined, to say the least. We were taken to the kitchens of the Disney chefs, listened to cookbook authors speak of their new books and tips about food trends, had a 5-course meal at one of Orlando’s hottest restaurants, and listened as Colin Cowie explained how he pulled off a $25 million event. After enjoying a weekend of food, fun, and observing the Bake-Off, it was time for the awards celebration on Monday evening. The ballroom full of ovens suddenly disappeared, but the next room became party central! It was set up like a nightclub, with a huge bar in the center, tables and chairs scattered everywhere, and a stage graced by hostess Sandra Lee of Food Network fame. The awards began right away. Lights were dimmed and the air was filled with electric excitement from the contestants and their families. The contestants entered by category and stood in front of the stage. 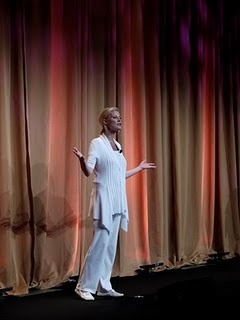 As Sandra Lee read each category winner, the place went up for grabs. After the announcements, the party began with music, food, lots of congratulations, and a few tears shed here and there. The four winners were whisked off to a press conference immediately, so Kristina and I hurried out to attend. The four winners looked like a mixture of happiness and disbelief! I’m sure they were all in shock, especially since after the press conference they were whisked off once again, this time on a private jet to Chicago to appear on Oprah, who would announce the winner. The next morning as the four category winners were preparing for Oprah, their recipes were prepared and delivered to the press room back in Orlando. Kristina and I couldn’t wait to taste them, although it was sort of strange having fish for breakfast! We listened to what others were commenting on the winners, chatting with other press people, and feeling a little sad that it was all over. People were quickly exchanging cards and good wishes. 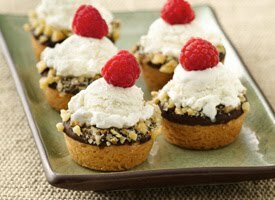 At that time, we didn’t know the million dollar winner of course, but found out the next day that it was the “Mini Ice Cream Cookie Cups” from Sue Compton of New Jersey. The entire Bake-Off experience as a blogger was fascinating. I am so grateful to be a former contestant, and grateful for the opportunity to write my blog about something that has meant so much to me and my family. I also want the contestants to know how much their creativity and hard work is appreciated, whether one wins or loses. Everyone should be very proud to be one of the fortunate 100 finalists. I know losing can be a let-down, but no one is really a loser. Every contestant is special. I know because I felt every single one of you as I walked past your ovens. Now go get started on the next Bake-Off! It will be here sooner than you think. And I hope to see you there- as your blogger-reporter! See you next time! Hee-hee! The Bake-Off Million Dollar Winner!!! Fantastic blog! I loved reading about the bake-off from your point of view. It sounds like you all had a great time. Thanks, Karen! We had a fabulous time. What is better than the Bake-Off?! Glad you had such a good time. Out of all the things you got to taste did you have a favorite? Unfortunately, we didn’t get to taste that much on the Bake-Off floor. Many people did not have samples because they didn’t make a third optional entry, or by the time we got to some contestant ovens, the samples were gone. They went fast! I did taste the winning recipe and it was really good. What a very nice article. Brings back so many memories of my three times as a Bake-Off Finalist. Thank you, Pat! It’s always a thrill to hear from former contestants who hold the same Bake-Off memories! Great blog and great review of the Bake-Off, Debbie! It was also so nice to meet you – and Kristina and Kara! You are right on with your statement “What is better than the Bake-OFF?” From the moment you get that call to the actual event, it is such an exciting experience! 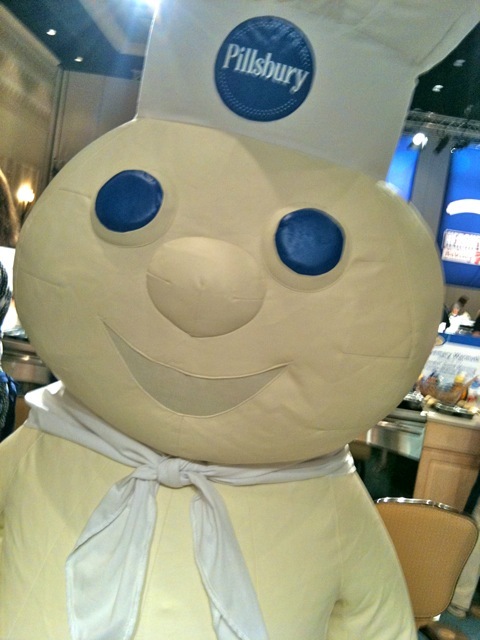 Pillsbury certainly knows how to do it right! I hope to meet up with you again in the future! I hope we can meet again, too! I’m glad you enjoyed the blog! A*W*E*S*O*M*E update, Debbie! I felt like I was right back there again! It was such a pleasure to meet you and your beautiful and talented daughters and I am looking forward to our paths crossing again soon! Thanks, Brett! One of our highlights of the contest was finally getting to meet you. We can’t wait for our paths to cross again. Let’s try for Sutter Home! ?